If you have read this blog for a while you will know that I did 11 long years as a sessional lecturer in various architecture schools before scoring my current job as Thesis Whisperer (for those in the US, this is the Australian equivalent of adjunct professor). I never had trouble getting classes, but the steady supply of ad hoc teaching work was a trap; it seemed to hold the promise of leading to a career, but never really did. Not to put too fine a point on it, sessional teaching was badly paid. One year I kept a careful count of my hours inside and outside of the classroom, divided my taxable income by the total and worked out I was taking home $17 an hour. As it turns out, being a casual lecturer paid less than all the part time jobs I did while studying for my undergraduate degree – including washing dishes in a restaurant. To rub salt in the wounds, I was getting about half the pay of a level A academic and working twice the number of hours in the classroom. This made me angry. The good kind of angry. The kind of angry that made me want to change my life. I took up post graduate study and, through a series of happy accidents, hard work and the support of Mr Thesis Whisperer, ended up with a permanent academic job that I love. The path to academic nirvana was not easy, in fact it was ridiculously hard. 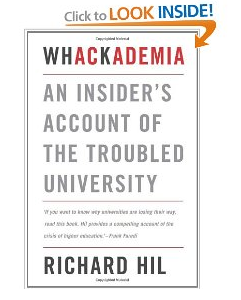 So when @sarahstow showed me the blurb for ‘Whackademia: an insider’s account of the troubled university” I immediately left the office to buy a copy, solely on the promise in the title. Academia IS whacky. I’ve sold stuff in supermarkets and book stores, dabbled in the music industry, washed dishes in restaurants, driven courier trucks and cleaned houses in addition to working in architects’ offices. Academia is, without doubt, the strangest place I have ever worked. I read the book quickly; in just two sittings. The first thing I want to say is this book made me angry. I was angry when I agreed with what it had to say – and even angrier when I disagreed. When I put it down I had conflicting feelings, but the over riding sense I had was disappointment. Dr Hil introduces the book well. He criticises academics for succumbing to a ‘culture of complaint’ about the way universities run and their individual workloads, and for not suggesting viable alternatives. He also highlights the parlous working conditions of casuals. So far so good; I found myself nodding in furious agreement. Hil then goes on to give an amusing account of his own university days, stumbling towards knowledge. On reflection, I would have been much happier with this book if it was just presented as the memoir of a grumpy old (academic) man. Dr Richard Hil, like me, is a first generation academic. Unlike me he had the good luck to go to university in the 1970s and didn’t have to pay for his education. If we are to believe Dr Hil, Things Were Better Back Then and it all went to hell in the 80s when the government had a neo-liberal makeover. Suddenly academics were accountable to taxpayers for the money that was spent on higher education and fees were re-introduced for students, in the form of higher taxes for graduates. To top it off, the government encouraged – with more sticks than carrots it must be admitted – universities to start selling education to students from overseas. This all led, according to Dr Hil, to the sad situation where students no longer are trained to be good citizens, but are treated like ‘shoppers’ who have: “come to expect a product – a degree, diploma or doctorate – that will equip them for jobs in the employment market place”. Campuses, Hil claims, have become more like shopping malls, complete with cafes and shops. I found myself wondering: what is so bad about that? I started my undergraduate education in 1989, the year fees were introduced. I remember boring, irrelevant lectures from professors who had not changed their slides since the 1960s and you certainly couldn’t get a decent coffee on campus for love or money. I’m not at all sure my undergraduate education was value for money, perhaps Dr Hil was happier with his because he didn’t pay for it? Dr Hil argues that the problem with students being treated as shoppers is that academics are not trusted to do their job, which Hil believes is to produce engaged and informed citizens. I do think Hil is right that it’s a mistake to see tertiary education as purely vocational. My job didn’t exist back when I was in uni, neither did my husband’s, sister’s or my brother in law (who trained as a photo journalist and now works in writing internet standards). While we can’t predict the future, we can help students to be critically aware and ethical professionals, and this does not have to be at odds with ensuring quality. In my opinion, regulation to improve and ensure teaching quality is necessary. I have the dubious pleasure of working in the most lightly regulated part of university teaching: research education. Until recently, PhD degrees didn’t even have time limits, let alone statements of outcomes and expectations. Working without much regulation creates problems – for students and for staff. In fact, in my opinion PhD students would be a whole lot better off if they were treated more like shoppers. If I buy something that doesn’t work as advertised I can take it back. Universities sell the opportunity to gain a degree, but some PhD students find all sorts of barriers are put in the way of taking advantage of this opportunity. I don’t write about poor supervision in my insitution, but that’s not because it doesn’t exist. Most of the problems I see occur due to lack of oversight and rules, not because of them. Although Dr Hil complains at length about the ‘paperwork’ which follows regulation of teaching quality, he gives very few tangible examples. I deal with a lot of paperwork in my job, and some of it is annoying, but it doesn’t take over all my working hours and leave me exhausted. What can leave me exhausted is my ambition: to write this blog and a book. These extra writing tasks will not, despite my best efforts, fit within my working week. But here’s the thing: there’s no real consequences if I don’t do this extra writing. Sure I might not get promoted, but I wont, at least at the moment, get fired. The most disappointing aspect of this book for me is its failure to live up to the promise of being a resistance manual. I agree with Hil that there are problems in our academic workplaces, especially with the vast numbers of marginalised employees, but the list of tactics he offers at the end are not very useful. Academics without the benefit of a permanent position (tenure) would probably find themselves without a job next year if they followed them. Hil’s suggestion to pretend to listen to, but basically ignore, those like me, who work in improving teaching quality is, frankly, arrogant and uninformed. In my view, academics who are overwhelmed by their teaching load should seek advice from specialists like me and my colleagues in learning and teaching units about how to make changes to the way they work. If the advice we give isn’t good, then give constructive feedback to make it better. It’s dangerous for any professional to assume they have all the answers and only need to be left alone to do their job; constant learning is part of being a professional in the first place. So – should you buy this book? If you want to read a well written and entertaining critique of higher education, you should definitely buy it. In the end, although it made me angry, it was a good kind of angry; the kind of angry that made me think deeply about what we might be able to do to make academia a better place – for everyone. I know many of you who read this are teaching – either as casuals or in permanent positions. What do you think? Do you think there’s too much regulation on academics? Are too many talented people left to languish in marginal employment? Do you think your workload is impossible and/or unreasonable? If so, what do you think we can do about it? Is the university a bad boyrfriend? This entry was posted in Book Reviews and tagged higher ed, whackademia. Bookmark the permalink. « What is the best way of taking notes for your PhD? Sounds like an interesting book. I’ve never worked in academia and I’m doing a PhD remotely so academic life is something I see at arm’s length. I did my undergraduate degree in the early 90s (before Voluntary Student Unionism) and there did seem to be more ‘life’ on campus in those days. Most of us lived at home and didn’t have to work much, if at all, to maintain a decent student lifestyle. Now it appears students are so much busier juggling 30-hour work weeks with lectures and tutes. It all seems less leisurely now. Much less idle hanging around campus. But maybe I’m just a grumpy old woman! I might offer an alternative perspective on the idea of students as shoppers though. How much does it set up the expectation that a degree is something that is bought rather than earned? I agree Regan – the ‘student shopper’ is a dangerous concept if you think universities are selling degrees and ‘experiences’. I think the marketing of universities is generally atrocious on that front – in that I entirely agree with Hil. But if you think about the university as selling opportunity to get a degree the emphasis shifts a bit. You still have to earn your degree, but you have the right to be offered an opportunity is equal to any other student and for the expectations for achieving it to be clear. It also means you have the right to demand that supervision enables you to achieve those goals, not to hinder you. And you have the responsibility to make sure you produce what is being asked of you. I hope that was clear in the post. That makes perfect sense. I think I was lucky to have pretty good teaching standards throughout my degree. And even though I have no knowledge of what came before, I find the current structure of expectations of RHD students helpful – especially when you’re not immersed in academia on a daily basis so no chance to pick it up by ‘osmosis’. Great review Inger. Thanks. I get cranky with the view that Unis were perfect places before all these new staff positions were created to support teaching, learning and research (but then I would say that I suppose, working as I do in teaching support). But I also sit on the occasional academic committee, and have been privately appalled at the attitude of some academics to staff positions like mine – as you say, how arrogant to think that you can be an expert in everything! I sat on a committee that was reviewing a particular essential part of teaching practice for a year or so, and got really depressed at the resistance to modern educational thinking displayed there. You can whinge all you like at the increased surveillance of or interference in your work, but oddly the people who are making the effort to keep up to date with educational practice seem to complain less than the people who are being neither reflective nor prepared to continue engaging with the world. Of course, it’s not only educational theory that’s changing: everything is, all the time, and no-one’s finding it easy to keep up. But that’s the job, that’s what it means to work in education. Having just slipped under the fence from a faculty academic position to an academic position in a teaching support unit, I think the problem is that both sides carry on in some ignorance of the gritty parts of the other’s day job. In the teaching support context, I hear some extraordinary things about what academics might be expected to do to better themselves, that are pretty indifferent to the realities of academic workload. Meanwhile back in the trenches, there are certainly still some defensive ideals about the “subject matter expert” as everything-expert, with nothing to learn. But as far as I can tell, these are fewer than the stereotypes propose. The bigger issue is how many academics just don’t know that there’s support available to them. The only conclusion I could come to is that some academics are so terrified of the ‘litiguous student’, who will find every loophole to demonstrate that you are not doing your job, that the thought of not having a paper trail – however useless – is frightening. I can completely understand this. It’s vital that we support academics in their value judgements or else we are nothing more than a degree factory. But we also need to provide protection for students. It’s not an easy area to work in, so I get really angry at people like Hil who assume we are useless and uncaring apparatchiks of an oppressive managerial system. it’s just not that simple. I have come to believe that the key skill of academic work is strategic prioritisation. Don’t waste hours prettying up your information-only LMS site; quick and dirty is what students need. Don’t answer emails from students asking for info that you gave in lecture and is in the LMS site; you’re not doing them any favours. Don’t apply for grants that you don’t have a hope of getting – unless you’re going to reuse the thinking behind the application elsewhere. Don’t feel you have to proofread and spell/grammar check your students’ work (including your PhD students); there are agencies on campus to deal with this. I don’t know how you teach these skills – by mentoring ‘at the coal face’, I suppose. Agree! I used to throw out the mail from other units too… Then I realised I was missing opportunities to get involved and add my voice. A recent instance of this was RMIT’s development of a social media policy. I disagreed with the need to have one at all, but when it became clear it was inevitable I threw myself into the process with gusto. The last thing I wanted was some uninformed piece of rubbish. The process so far is positive – when the blind spots in the policy draft are pointed out, the people drafting it respond and have a conversation about what might be improved. RMIT reviews and change policies frequently to make sure they are working. Being part of the review process means you have a chance to fix the system. I know it’s more work on top of what we already do, but in my view it’s better than just complaining after the fact. How do you communicate with people who trash your emails? Find another way to communicate. A lot of our support people don’t know how to write a plain English email so we tend to ignore on the basis that they will come again another way if it is really important. I fully agree about the strategic prioritisation of time. If you don’t want to spend your career as an overworked level a or b you have to learn to focus on what the institution truly values and rewards. I’m a bit flummoxed by this – if I get an email that isn’t in plain English I write briefly and ask what they meant in case it’s important. And I really don’t know what other ways there are to communicate with a workforce of 5,000, working in about 15 different sites. I suppose we could set up billboards on each of our campuses, but some of them are hospitals, and they mightn’t like that. 🙂 Our ‘main campus’ takes 20 minutes to traverse, so several billboards would be necessary, even on that one. Truly, email is the most efficient way to communicate en masse to a big central and geographically distant campuses, and i really think it’s arrogant to pretend you’re too important to participate in your university this way. M-H …. Perhaps we’re talking at cross purposes. But dismissing feedback you have now had more than once, and insistence on broadcast email as a tool for change, and labelling front line resistance as arrogant, all tell me that you are unlikely to be very successful imposing your reforms. Email’s not our only communication strategy, of course. We have faculty representatives (staff members from each faculty) – but they mainly communicate with faculty staff by email too. And we put messages on our login page, but that’s no use for people who aren’t teaching this semester, or who never look at their eLearning sites. We don’t have the resources to phone thousands of people (we have about 6000 eLearning sites, with about 4,000 staff names in our database). If you can suggest a way to reliably inform this many people of deadlines for site creation, checking and archiving, not to mention the other services we offer like projects and training, I’d really be grateful. Social media practice and infrastructure tells us that people trust sources they already know. I think peer mentoring ‘at the coal face’ and networking are great ways of distributing information, because the source is already known to the person receiving the information. As many teaching and learning support units are understaffed, relationship management which acknowledges power at the coal face can help reduce barriers. Faculty representation can be useful if adequately regulated. (By regulation, I refer to the establishment and maintenance of systems and procedures for achieving a set goal.) Representatives need to be comfortable with their role as conduits, which means they are given time and resources to complete the task, receive regular, relevant development opportunities, and even read the dreaded emails. Reports can be co-constructed to allow input from non-representatives. The intention is always to improve the opportunities for effective decisionmaking. It is a good title! I work in a fulltime fixed term position convening a large first year unit. I did my undergrad study in the late 90s/early 00s in NZ when fees were between 12,000 and 15,000 per year for an arts degree. I mostly worked over summer and saved it up, lived on weetbix and raided my parents freezer/cupboards whenever I visited them. I lived in a hostel on campus, did my own cooking, and cut up my eftpos card when they started selling coffee so I could stick to my $30 per week food budget. It was pretty hard. I took a year off to work in a book store to pay for it! I came into my job assuming the students were similar to me — sacrificing a lot to achieve a degree, and also with a desire to treat them as capable adults. I avidly read anything I could on teaching uni students including doing a couple of bits and pieces through our LTC/LTU. I tried out many of the ideas including assessment for learning, peer review, flash visuals, learning outcomes and so on. After a year, I have gone off the LTU advice a bit. One of the reasons is the uni as a mall attitude. For example, there is a percentage of students who believe that even if they have not come to lectures, read any of the email announcements I have sent, logged into the class website, or done the readings, they are entitled to an emailed individual explanation of the assignment/exam/their grade and so on when they request it. It’s almost like I am offering a whole range of communications and learning options and they are allowed to pick and choose what they will do. These particular students seem to have little sense of responsibility for the choices they make re studying, and also have little sense of the consequences. I put hours and hours into teaching preparation, much much more than my workload allocation, yet it doesn’t seem to make any difference — the students who want to work hard, learn, and the others still make excuses! I think if I just gave them a list of readings I’d probably get the same outcomes! In more positive moments, I think our job with first years is to TEACH them how to be a uni student, and that involves ‘rights’ as a customer AND ‘responsibilties’ as a sort of employee…. In responding to excuse-type emails, I have discovered that if I emphathise with them first, then explain the consquences of their inaction, they generally get it and do not in fact pursue any special consideration and do seem to come through a bit better on subsequent work. IPerhaps have taught them the consequences of not doing work. eg. ‘That’s sad you broke up with your boyfriend, sounds like a difficult time. Your essay certainly reflected how difficult it was for you to concentrate, and how little time you had to do the readings or attend lectures. The main consequence at this stage is that your grade has been reduced by 2% due to lateness, and that the quality of your work resulted in a lower grade to begin with. If you would like to catch up on the reading then do some practice exam questions, I am happy to take a look at them and let you know if you are on the right track for a better exam grade. It’s working! There have been some really good responses with students even thanking me and apologising for wasting my time…. Thanks for such a long and interesting reply Kelly. It’s interesting what you say about empathy. I spend a large amount of time talking to PhD students about how to empathise with their supervisors. Starting with a position of understanding is one thing, really making an attempt to think about what it is like walking in another’s shoes is even more important. This goes for people like me who work in central units as much as it does for those on ‘the front line’ so to speak. Inge, I think your comment about PhD progress reports and how much of it was faked is an example of this and suggests what I think is the underlying problem. i.e. that when it was recognised that there needed to be some level of accountability/regulation on academics, what was brought in was generally pretty badly done. Much of what I believe is Whackademia (based on listening to the author’s appearance on RN) is evidence of how badly it’s been done, which means there’s no surprise when he offers task corruption as a solution. The solution – which seems to be evident in the comments so far – is to do it well. To do it in ways that fit the context and nature of academia. To some extent this is at the heart of the death of learning post. Each of the archetypes are examples of important roles being done badly. There is a similar critique on the British University System, written as a black comedy novel called “University Shambles”. http://universityshambles.com seems to me that the Australian and UK systems are much the same now… but where are all the practical people these days? While I agree with you in some respects, I don’t think that buying into the idea of students as shoppers is constructive. Ensuring students’ rights to a quality education and providing the means for redress are not the same thing as treating us/them as customers. Immediately prior to starting my PhD I was working in a university in a specialist admin role and had the dubious pleasure of witnessing the attitude of academics to support staff generally. I have seen extremely capable admin staff in tears after being sworn at by professors because the professors can’t own up to making mistakes in their record-keeping – and yet if the administration introduces staff to handle more of these tasks (not tasks dreamed up by the university, but required by the government) then it is “bloated” and a waste of money. I come from a family of academics and my husband is a recovering academic; I know many lovely individuals who are academics. However, I do not want to be an academic (I am doing a PhD to address a specific research question not as a stepping stone to an academic career) because I have met all too many who are just plain arrogant about their elite status and treat hard-working colleagues with disdain and bad language. I find it particularly distressing when this behaviour is exhibited by senior academics on three or four times the salary of the junior clerks they shout at – this is not the lovable eccentricity of a dotty professor, this is bullying. The inability to admit that they were not born brilliant teachers and might need support is another aspect of this arrogance, and I find it all too depressing. I am afraid I have lost patience with those who pine for the “good old days”; too many of them are carrying a chip of extravagant proportions on their highly-educated shoulders. But I am not convinced that the PhD process as it is currently constituted is going to produce a new generation of more collaborative and open academics who respect colleagues with complimentary skills – though it would be wonderful if it did. I find this a fascinating discussion. I am in the first year of my PhD but I am a mature student with children who was a secondary school teacher before returning to university. I would never dream of treating any of the staff, academic or support, with the level of arrogance displayed by some of the undergraduates. I would have expected my 14 year old pupils at school to take more responsibilty for their own learning than some of the undergraduates I have seen recently. There is a definite sense that as they are paying for their education, they deserve a degree whatever their work level or ability. Given that unis are telemarketed, mysteriously rated, have a CEO laughingly also referred to as a VC, are managed by non- or pseudo-academics, that academics have to sell their research skills to the highest bidder, and given that a postgrad student is a unit of currency, why shouldn’t students treat universities like chainstores? BUT if you as a serious Ph D student who wants to learn what a true university is about, find an academic as a supervisor who cares about scholarship and philosophical enquiry in your chosen discipline, and treats you with the respect you deserve. You may still end up with a ticket to nowhere, but you will have learned something of inestimable value on the ride. Hey Inger, I agree with you about education being seen as a commodity under our current funding arrangements. As an undergrad I remember being extremely pissed off with a lecturer in my school – this person was the subject coordinator and come the day the results were to be posted, had no idea where approximately half the class’ completed assignments were. Furthermore, they knew that they would not have the results ready for posting well before the day the results were due to be posted, and did not inform the students enrolled in the subject in any way shape of form what-so-ever!!! As for the subject – well – it was about communication!!!!!!! I was the one who got a talkiing to because I was a tad upset that the results for this subject were not available, no-one in the school (with the exception of the subject coordinator) knew what was happening, and the one person that did was … unavailable (surprise, surprise). Then there is the other side – I do feel that some people employed in unis (nominally in the commercial offices) seem to forget that without students they would not have their jobs. Mind you, I have long felt that about public servants in general. I recently attended a lecture where the topic of not biting the hand that feeds you came up – most of the courses offered at uni are accredited by the relevant professional body, which in turn dictates what is actually taught to the students. I remember trying to get course changes in my own field to cover what I saw as a gap, and was told the key was to convince the professional body. We all seem to buy into the notion that our current market oriented society, with its’ emphasis on cosuming manufactured goods as the way to peace, prosperity and happiness for all. It is only a few brave souls who would dare question this mantra, cos it comes with consequences – such as ostracism. I am surprised how you can even ask the question. I guess if spending hours and hours filling out forms instead of doing intellectual work does not bother you, you are in the right place in academia. Inger I’d love your advice on whether or not to teach through my PhD. I’m doing my PhD in the hope of becoming a lecturer, but have heard from others that they thought teaching through their PhD was badly paid and a time eater. My problem is this: if I want to teach for a living after completion shouldn’t I start getting some experience in, you know, teaching? Other people have told me that teaching experience won’t get me a job as an academic – what do you think? I don’t know how to advise, honestly. It was my experience being a good teacher did not help me get a job – having a PhD and publications did. I did however have some 11 years of teaching under my belt already, so I dropped teaching while studying as I found it too distracting. I wonder what others think? My feeling is to do some teaching for the experience, but once you have that experience don’t do it unless you are desperate for the extra money. Some postdoc jobs won’t care but others will and having a few subjects under your belt looks good. I think the sessional teaching set up is fine a couple of times and you can accept the not-so-good conditions as a type of apprenticeship, but make it really work for you. – Try and teach a subject related to your PhD work so the unpaid reading etc has some advantage. – Try to get some good mentoring in teaching from the lecturer in charge or from your colleagues. – Be firm about sticking to a reasonable workload, ask up front about expectations (like paid making, prep, consulation, meeting and lecture attendance) and get them written down. – Also if your workload looks like it will be substantial consider taking leave while you teach (if allowed) as my experience was that the PhD takes a back seat for at least the first month of teaching (if not the whole course). Last year I felt that after 6 years of teaching, which included coordinating experience, with no subjects available that were especially close to my own area of expertise that I had gained enough experience and sessional work was now just badly paid work and I was better off finding something else to pay the bills while I looked for more permanent/better paid academic work. Taking on a new job while beginning a PhD means that you can’t give enough to either of them. The fact you need to stand in front of a class room each week and perform, whereas your PhD has very little performance measures in your first year, means that teaching typically becomes ones priority. This is good for the university, not so good for you. Many of my colleagues whose supervisors weren’t so considered lost their first year to teaching, and entered second year without much done and without established work practices to get their PhD done. So, spend your first year developing your project and good PhD habits. Then take on a SMALL teaching load in second year. I teach in a school that has two-hour tutes and I would not take a course with a one-hour tutes, although I think these are becoming the norm. With one-hour tutes, you need to teach twice as many classes to earn the same amount of money which is all well and good until end of semester when you have to mark 80 essays rather than 40, on top of the doubled administrative workload (emails, meeting with students, entering results – none of which is paid for, even if your marking is). Also, it is good – career-wise – to teach in broad subjects that most universities offer – research methods courses, or generalist first year subjects, This means that your teaching experience will be relevant at any tertiary institution. I now teach a final year elective, which I love, but it is so specific that other universities probably don’t run anything similar which means that my teaching skills are transferable, but not my course expertise. Also, I find that when beginning teaching, first year courses are good because there are a lot of other teachers who can mentor you and you can gain advice from. Small courses it’s typically you and the lecturer and it’s assumed that you know what you are doing and can organise your own class plans. I am now in my final year and am not teaching first years anymore. While it is rewarding, there is a lot more work with first years, and I felt that I couldn’t give them the time needed. They need much more extensive marking, and often you need to meet with many of them one-on-one. They also need you to help them more with other things – they start the year not knowing the difference between a lecture and a tute. There’s a lot of assumed knowledge that I think first-year teachers have a responsibility to decode for their students. Inger is right, you won’t get a job on teaching experience (Professors in my discipline have admitted that if you have a good publication record then they are happy to assume you can teach, but not vice-versa.). But you sound like you want to teach, and I assume, teach well. So get some experience under your belt , but be considered about it. Thank you Kat and Inger for you considered replies regarding teaching through a PhD. I started part time in June last year (with a 6 month old baby) and have been full time since January this year, so by the start of first semester next year I’ll be over a year in. I particularly appreciated the advice to keeping tutes on the same day. I guess I think about my whole PhD as being an apprenticeship, and for that reason I’m not overly bothered by pay rates if I can get some good teaching experience without it taking too much from my work. Obviously it’s a fine balance and I guess I’ll learn by doing (if I can even get work – there’s almost no funding for casual tutoring work at the moment). I reckon if you can limit it, and teach something that is going to help you complete. I taught a postgrad methodology module and it was absolutely fantastic, really helped me with the PhD and didn’t distract. But in the last year of my PhD I’ve had to pick up a fulltime teachig position for financial reasons and I am stuck really — I can’t apply for other jobs until I finish the PhD but the PhD is taking so much longer because of teaching. I got the job because of a research conference paper I gave and the right people happened to be there. ONce they checked my CV they saw I had experience convening first year units so they offered it to me (desperate, last minute, doesn’t nomrally happen like this). So I think experience must have some importance. But completion is more important for most jobs! Maybe clients is a better term than shoppers? Shopping can be associated with a sort of unthinking consumerism for consumerism’s sake. I think most students are more discerning, if maybe sometimes naive about the realities of study. I think university do forget about the service they provide. I saw a comment on a forum where an ugrad was complaining that she sends 1000s of dollars per subject and yet her tutor is never available outside of class. Having been a tutor I can guess they aren’t available because they aren’t being paid! That university charge more and more yet provide poorer and poorer quality is pretty bad business. Oh also I forgot to ask if you think the book is worth reading? I saw it had come out but was worried it might just depress me. Clients is a much better term I think – thanks Kat 🙂 And yes – it will depress you and possibly make you angry in an unhelpful way – especially if you are not already permanently employed as an academic. I think we need books like this to offer us more hope. That was the main thrust of my rant here I think.